With Pisces, we beg an the chapter of conflict in this Book Two of the star chart. We now ge a closer looks at the band that binds these fish together. 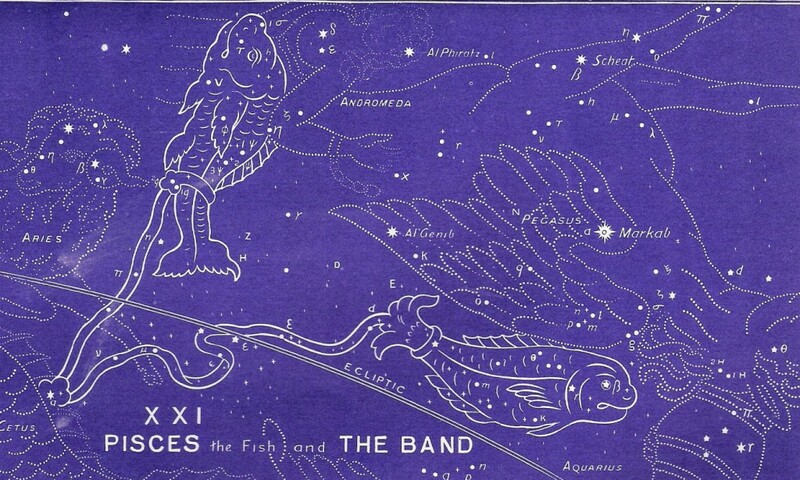 It is imperative that you have already read the page on Pisces before you examine The Band. It is there that we have already learned that Pisces represents the two “natures” of the saved (God’s people). As the one fish swims up, so we desire relationship with our heavenly Father. And as the other fish swims outward — so we have a relationship with the world around us. There is also a third creature involved here — one that appears to be much greater and stronger — and yet he is also bound by this Band. He is Cetus, the sea monster, who represents Satan. We will take a closer look at him later. But it is The Band that has our attention now. This Band shows us the nature of the conflict we will experience, and that is the three sources of sin in our lives — the world, the flesh, and the Devil (see Pisces). Yes, as long as we are in the world, we are subject to the weaknesses of our flesh. And we are certainly immersed in the influence of the world and the Devil. But that’s not the end of the story because our weakness in this flesh is the beginning of God’s strength. That strength is just another of God’s amazing provisions to us as we navigate these waters of life! The Band is seen binding the fish to the sea monster. But look carefully! The sea monster is also bound! Despite the fact that The Band (representing the sources of sin) binds the Redeemed (Pisces), it also binds Satan. Doesn’t the same evil that binds a slave to his master also bind the so-called master to his slave? Think about it. The slave is shackled by chains only so long as the slave-owner is shackled to the evil of slavery itself. So, how does this translate spiritually? Well, just as we are bound to the evil influences of this earth — we (the Church of Jesus Christ, indwelled by the Holy Spirit) is also holding Satan back from the complete destruction of God’s creation that He craves. The Good News of our deliverance from the penalty of sin is just the first of three parts of the Gospel. The second part is that we can daily experience the deliverance from the reign of sin in our lives by surrendering to the Lord Jesus Christ. As His co-heirs, we are free from the power of sin in our life. The Band is weak! It is just a faint trail of stars from us (Pisces) back to that old master (the sea monster, Cetus). And we really don’t have to pay any attention to it anymore! We are now able, through God’s indwelling Spirit, to live a life pleasing to Him. To continue in the correct order of the ancient star chart, please select Andromeda next. Be sure to download your copy of the Free e-book that explains the historical, cultural, and biblical evidences for this amazing star revelation.